3D FLICKERING WICK AND MELTED SHAPE — Flameless wax candles with unique 3D wick design, which can flick and dance like real candles flame. 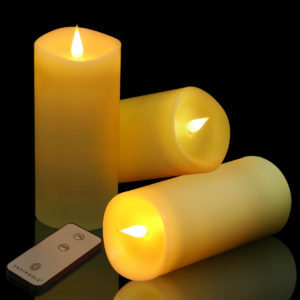 Together with melted shape, you will find it looks like a real candle, perfect replacement of a real candle. WINDPROOF LED CANDLE FOR INDOORS AND OUTDOORS — This life-like flameless candles can perfectly instead normal candle, with windproof led 3D wick, no smoke, no wax dripping or fire risk, perfect for parties, romantic outdoor movies, birthday parties, weddings, holiday celebrations and home decoration. WORRY-FREE AFTER-SALE SERVICE — Enkinddle as trustworthy seller offers all our customer who purchase this battery candles 1 year worry-free guarantee, please to contact our customer service team at any time.